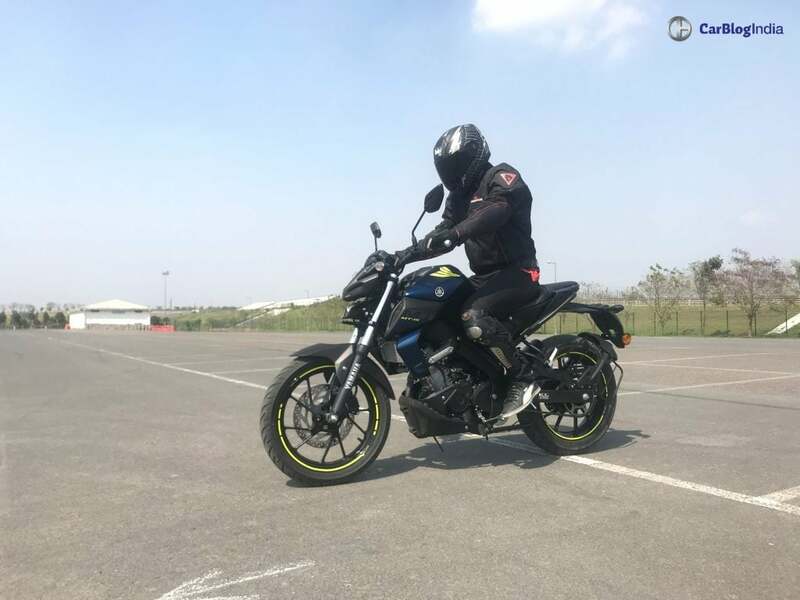 Yamaha MT-15 First Ride Review - Is it actually R15 with a naked body? 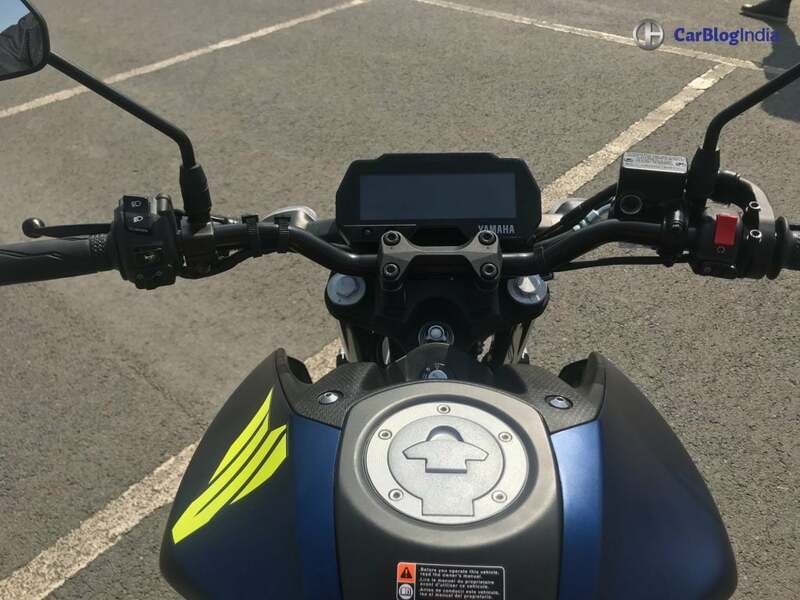 Yamaha MT-15 First Ride Review – Is it actually R15 V3 with a naked body? 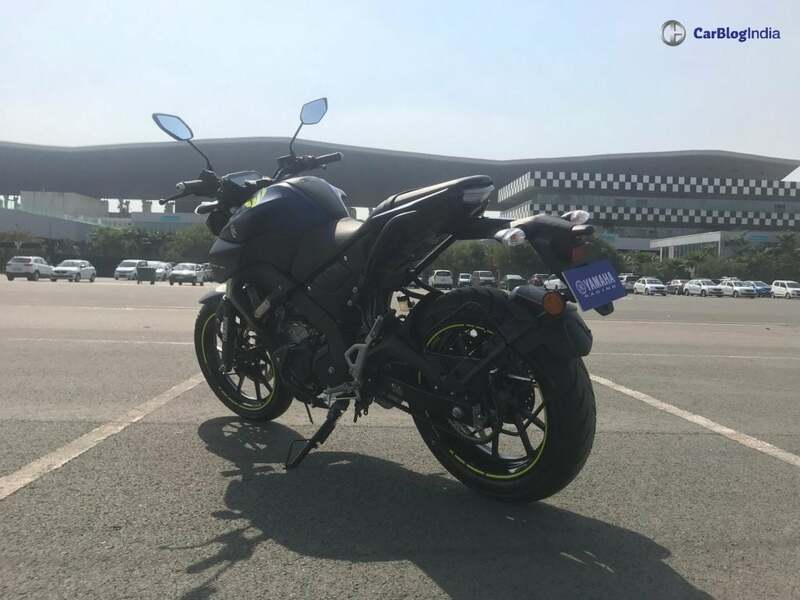 We got to ride the Yamaha MT-15 at the Buddh International Circuit. Here is our first ride review of the naked street fighter. So, Yamaha has launched the much awaited MT-15 naked streetfighter in India. At a price of Rs 1.36 Lakhs (ex-showroom), it is cheaper by R15 V3 by Rs 3000 but comes with the same performance. Also known as the Dark Warrior, it is the second one from the MT series, but not the last. Officials have hinted towards more motorcycles from the naked streetfighter series in future. 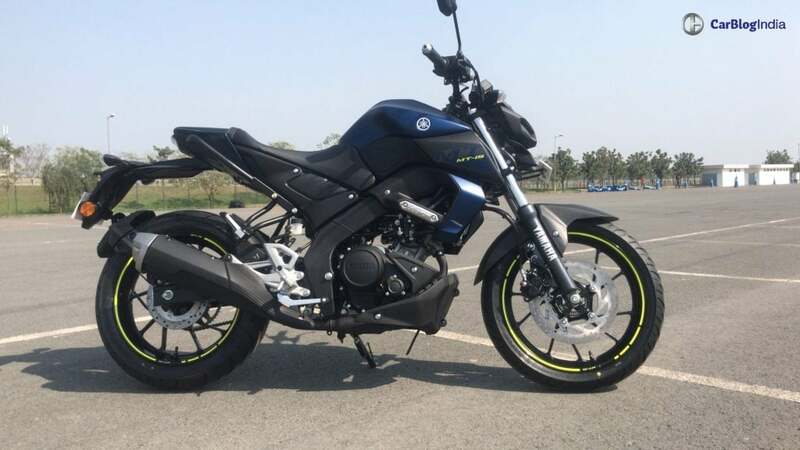 Yamaha MT-15 is a pure performance motorcycle. 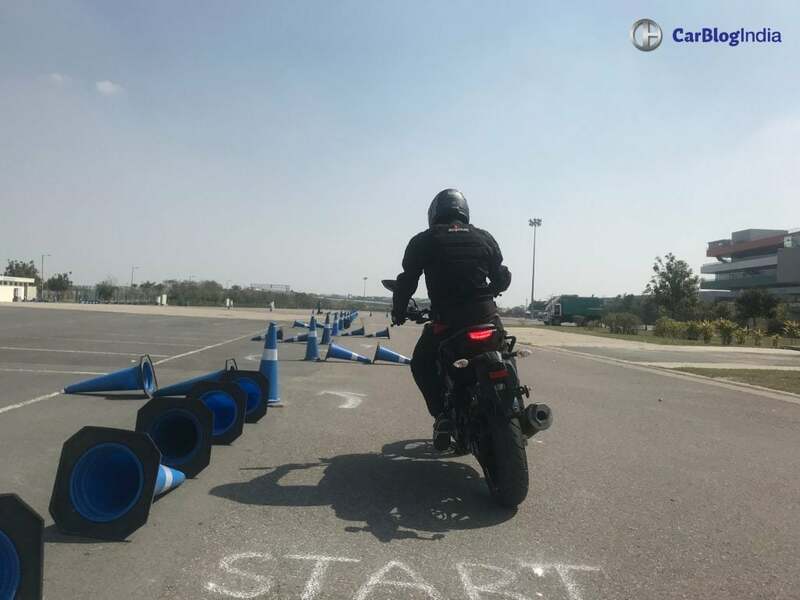 So, what’s better than testing the bike at the Buddh International Circuit, at a race track? 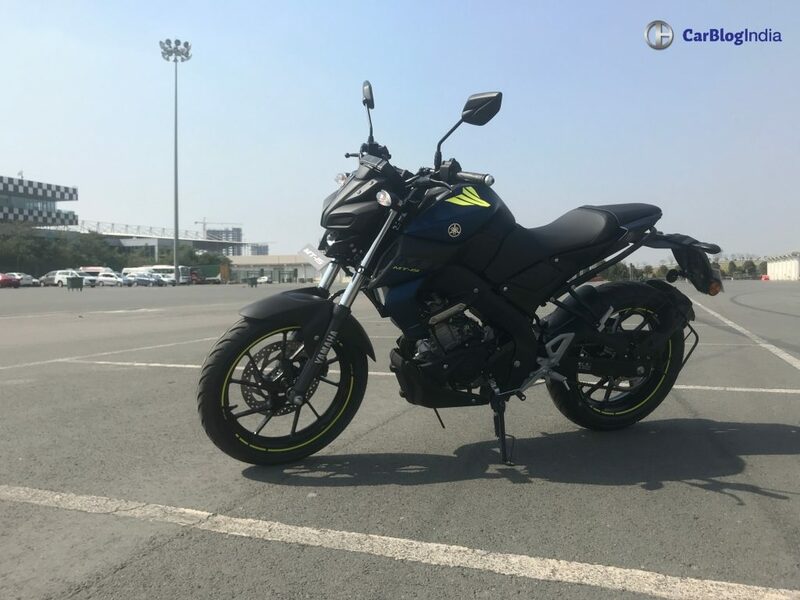 Continue for our first ride review of the MT-15 with an idea of its performance, acceleration and the handling. MT-15 looks very similar to the bigger bikes from its family, very similar to the MT-09. Do not confuse its design with the FZ series, because it is a whole lot sportier and premium. At the front, it gets the bug-eyed LED headlamps, sort of resembling a Samurai warrior. Heavy creases are seen over the body, blended with the matte black fuel tank extensions. The fuel tank gets the MT series logo with the logo atop. The single step up seats looks well crafted and it gets the pillion grab belt on the seat itself. So, the back seaters might be worried again because of no grab rail at the back. The alloy wheels and the exhaust muffler are borrowed from the R15 V3. I actually like the Yellow rim lining which only comes on the Matte Blue colour. The other colour on option is the Metallic Black. Summing up, it looks more premium than the FZ25 and maintains the premium sporty look that Yamaha performance motorcycles offer. Kudos! 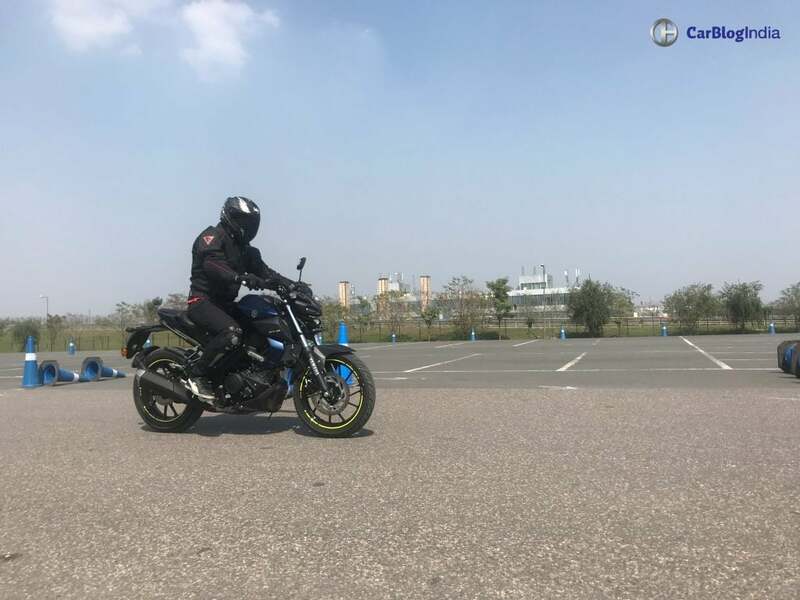 We got to test the Yamaha MT-15 for some time over a small test track. So, these are our first impressions of its performance. MT-15 uses the same engine of R15 but in a different state of tune. The final drive ratio has been revised and that combined with the VVA system helps in keeping the revs strong at the whole range. The Variable Valve Actuation system helps in the generation of the right amount of torque at the low-end as well as the higher-end RPMs. As a result, even above 7000-7500 RPM till 10000 RPM, the torque delivery is full packed. It gets comparatively strong low-end and mid-level torque. As a result, as you throttle up from the start, you would not feel much different if you have ridden the R15 V3. The engine is progressive and energetic. As you shift the gears up, the bike shows no lag as the torque keeps chugging in. The engine runs smooth which we were actually expecting it to be. Still, if we compare it with R15 V3, I found it not that great. Let me explain it properly. The riding was quite fun and would not dissapoint you a bit. But on a comparison note, it felt it MT-15 is not that punchy and not as fun as you get from its fully faired sibling. 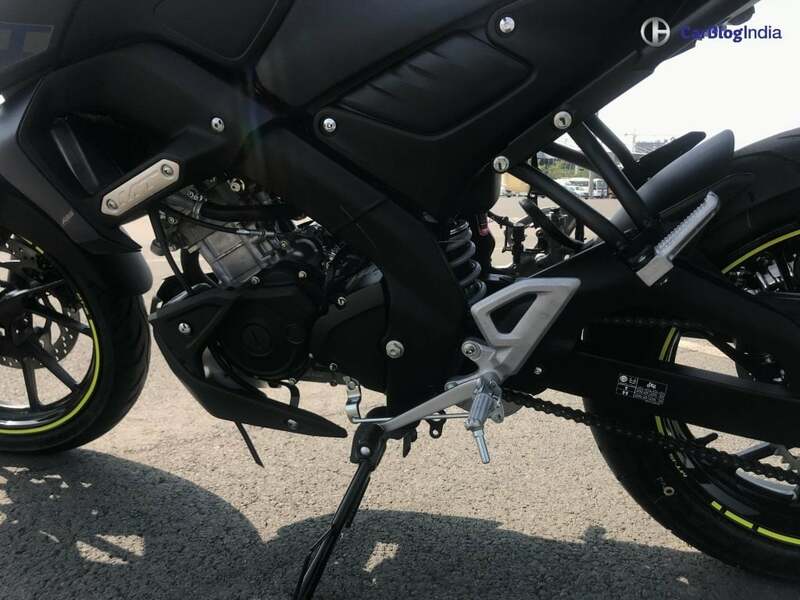 Yamaha MT-15 uses 6-speed gearbox with Slipper and Assist clutch, which was precise and quick. The clutch was light, which we expect would not fatigue the driver while going through heavy traffic. Even at the speed of 30 km/hr, the bike in 6th gear picks up efficiently. Most of the times you would not feel the need to lower the gears for lower speed. That maintains its practicality as well as the sporty behaviour. 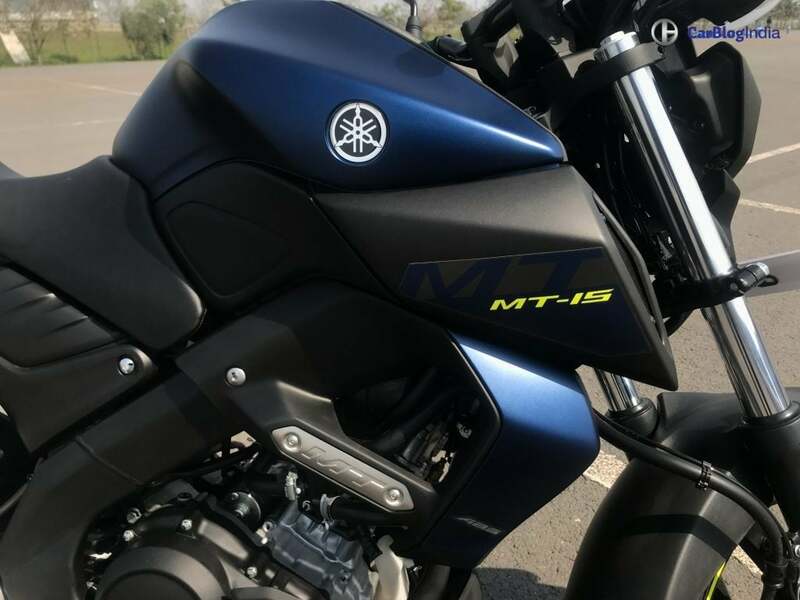 MT-15 uses a 155cc liquid-cooled VVA engine, that is capable of delivering 19.1 BHP and 14.7 Nm of peak torque. Not much of a difference. 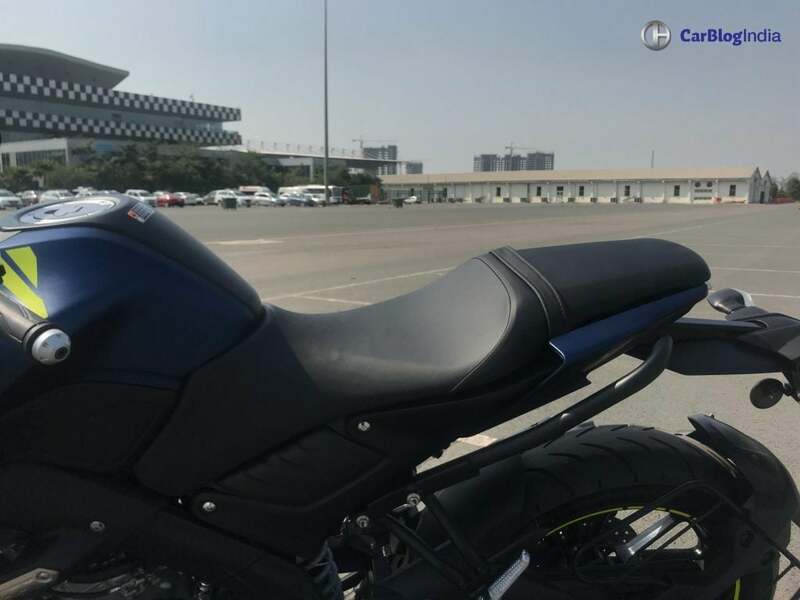 What we found the Yamaha MT-15 to be a flickable bike. It is very light and can be easily handled. I guess zip-zapping on the real road conditions would be a lot better than the R15. However, I felt that the sudden change in direction of the bike is a bit difficult. Probably, the shorter wheelbase plays a role in this. Despite being flickable, we expect a naked bike to adapt to sudden direction change. The riding position is still aggressive (for a naked bike) with rear set footpegs and slightly lower placed handlebar. It can easily shift roles as a city sports bike and a racetrack ready bike. 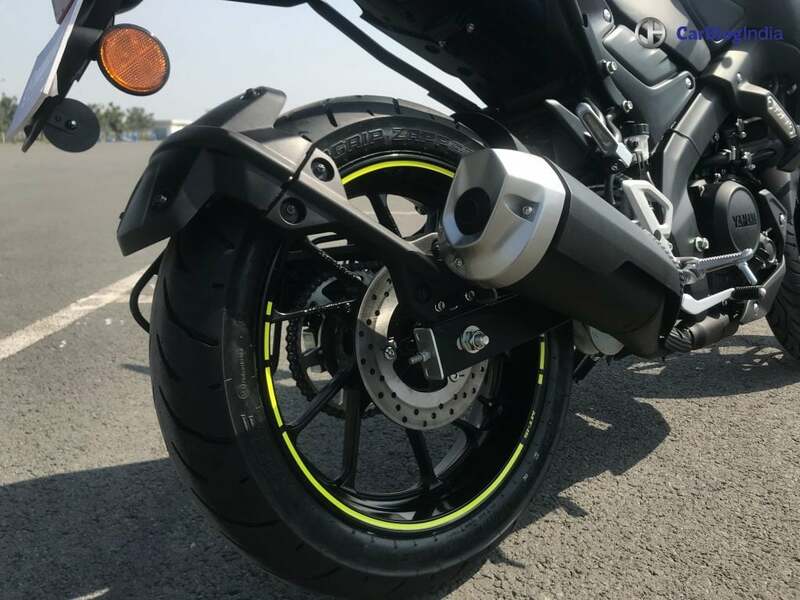 Yamaha MT-15 gets MRF Zapper Tires, without an option of the Metzelers offered on the R15. The grip is somewhat average, does not give enough confidence to put it through the corners. 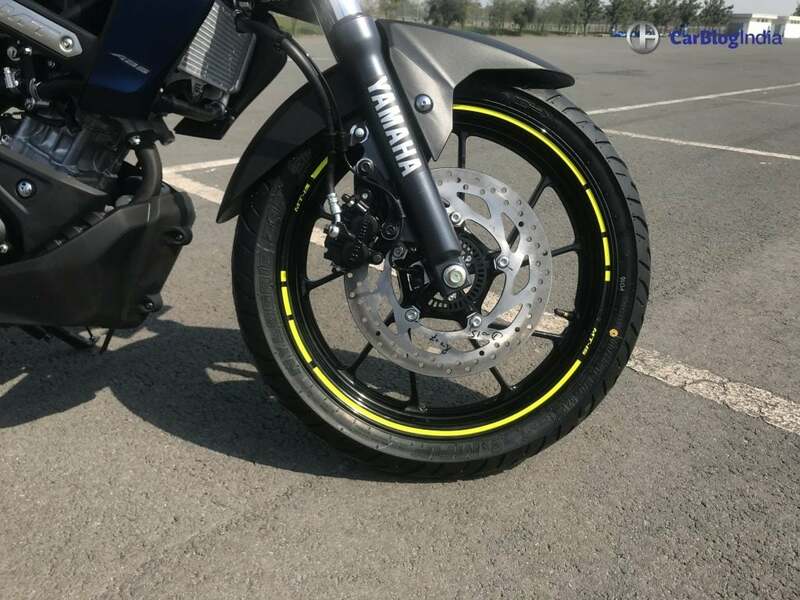 Yamaha has equipped the MT-15 with a 288mm disc brake at the front and a 220mm disc at the back, paired with a single-channel ABS. That’s where we, media fraternity were let down. The bite of the brakes is decent, do not expected too much. The progression and the feel is good, but not right on! As a result, during hard braking, the rear tire locked up almost every time. I hope that in time, Yamaha offers dual-ABS as an option. I found the pillion space to be a bit cramped. It’s not like I was expecting something accommodating. The grab rails are below the seat, just to make the pillion crouch a bit. MT-15 uses telescopic forks at the front and an aluminium swingarm with rear monoshock at the back. The same setup comes on the R15 V3. We could not check it over our regular roads, but we expect it to be the same. What features does it get? 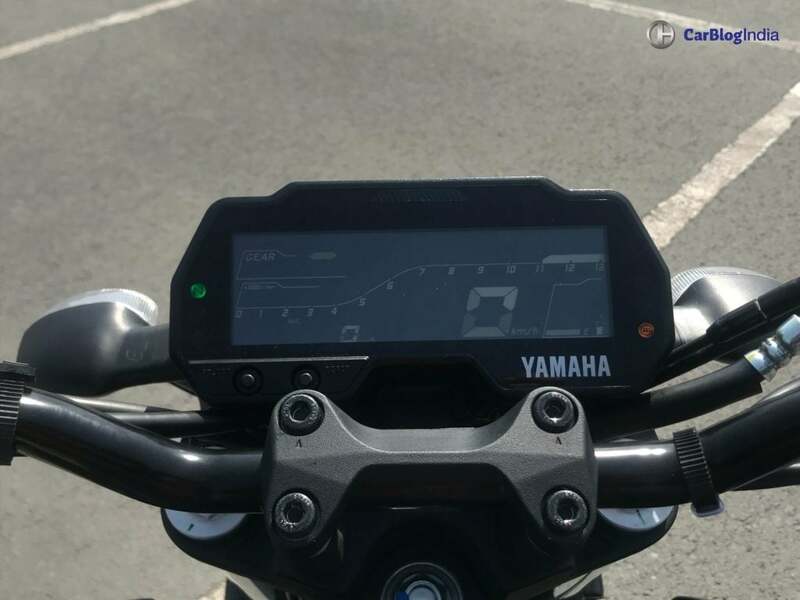 Yamaha MT-15 gets electronic fuel injection, single-ABS, negative LCD instrument cluster, LED headlamps and LED tail lights. The instrument console is the same, showing average fuel economy, average speed, trip meter, odometer, gear position indicator and the gear shift light. At an asking price of Rs 1.36 Lakhs (ex-showroom), it is certainly not less priced. 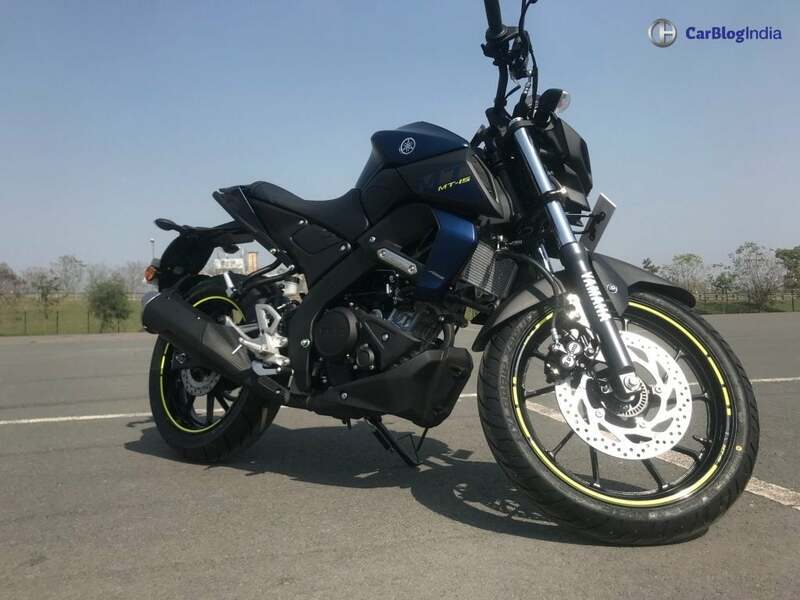 It competes against TVS Apache RTR 200 4V, KTM Duke 125 and Bajaj Pulsar NS200, for good. 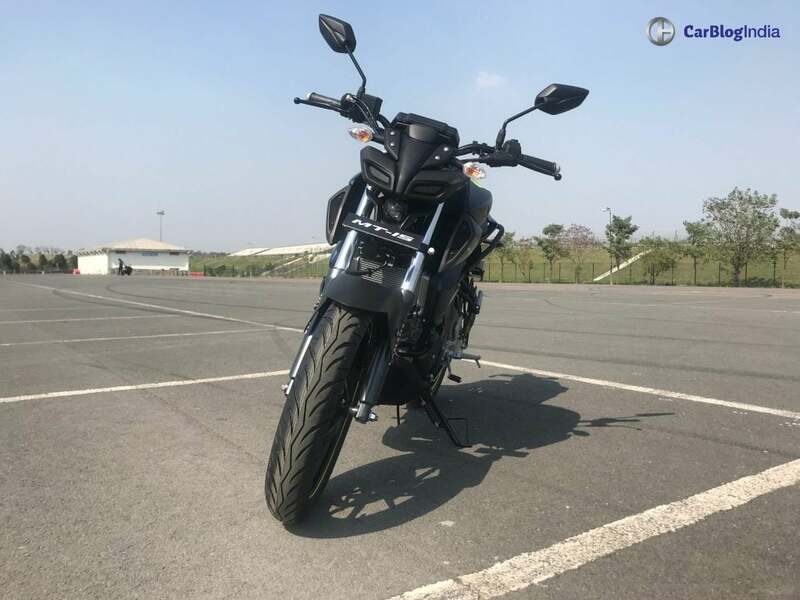 We liked every bit about the bike – its acceleration, its easy handling and the engine performance – but, still it felt less of a pure performance motorcycle. Basically, a city sports bike, which has capabilities of a daily commuter as well as often speed runs on long stretches. Comparing it with the Yamaha R15 V3, it has somewhat not achieved the standards that the fully faired version has set. However, it is likeable in its own justified ways. 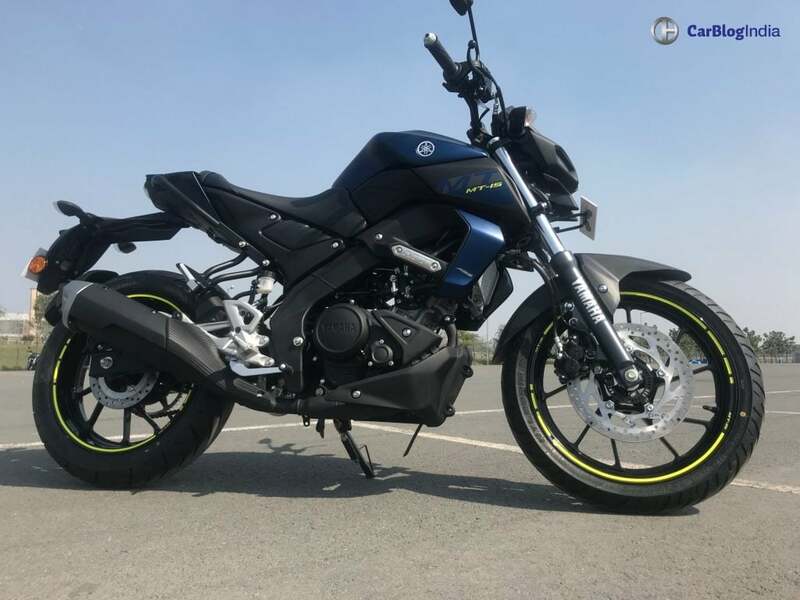 Summing up, with a heavy price, it actually comes as a tough choice between a 200cc motorcycle or a 150cc performance oriented bike. Those who love the feel of Yamaha engines, will not be disappointed. But first-time buyers will have something to think.